Babbitt is a white metal alloy that was patented by Isaac Babbitt in 1839. Over time, the term Babbitt has been applied to other similar white metals comprised of tin, copper and antimony. Lead can sometimes be added in place of the tin. 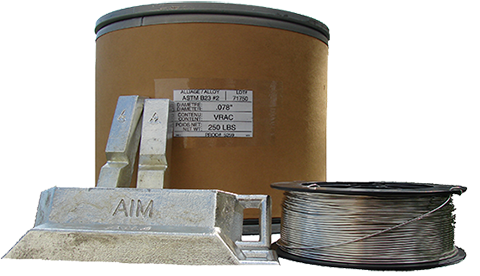 Babbitt alloys offer corrosion resistance, excellent wetting, low wear and friction resistance and are known for their hard/soft composition. While the tin and lead are soft, the copper and antimony form hard crystals throughout the structure. The wearing of the softer metal allows for better absorption of the lubricant as well as any foreign particles. Babbitt metal is used as the lining for bearing shells of cast iron, steel and bronze. The Babbitt lining prevents friction and wear that is common when a lubricant is not able to prevent the bearing’s moving parts from welding together. The Babbitt therefore extends the life of the bearing. Users of Babbitt ingot melt the metal in iron kettles from which they can ladle or pump the molten alloy. The bearing shell or backing is pre-coated with tin for tin-base bearings or with lead/tin for lead-base bearings. While the coating is still molten, the white metal is cast onto the backing and allowed to solidify from the bond inward. This prevents contraction cavities at the bond and restricts the growth of intermetallic compounds at the interface between the bearing shell and the Babbitt. The lining is then machined to a mirror-bright finish and specified thickness. Babbitt can also be sprayed onto the bearing shell with the use of a flame arc gun and Babbitt wire.